Wooly, this is for you. If you don’t like Kravitz or Prince, just skip it. Otherwise, you’re gonna wanna crank it my friend. Oh, thank you! Much appreciated! Have a blessed day, Lucille! Thanks, sand! The same for you. Hi, lovely! 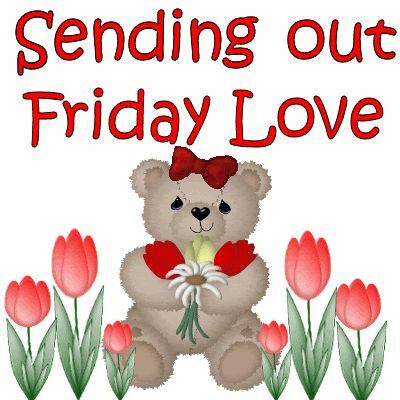 Hope it’s been a nice day for you. Isaac Asimov’s robot novels were the first science fiction I read, when I was 9. Above is a replica of Robbie, from “Lost in Space”, a futuristic version of The Swiss Family Robinson. 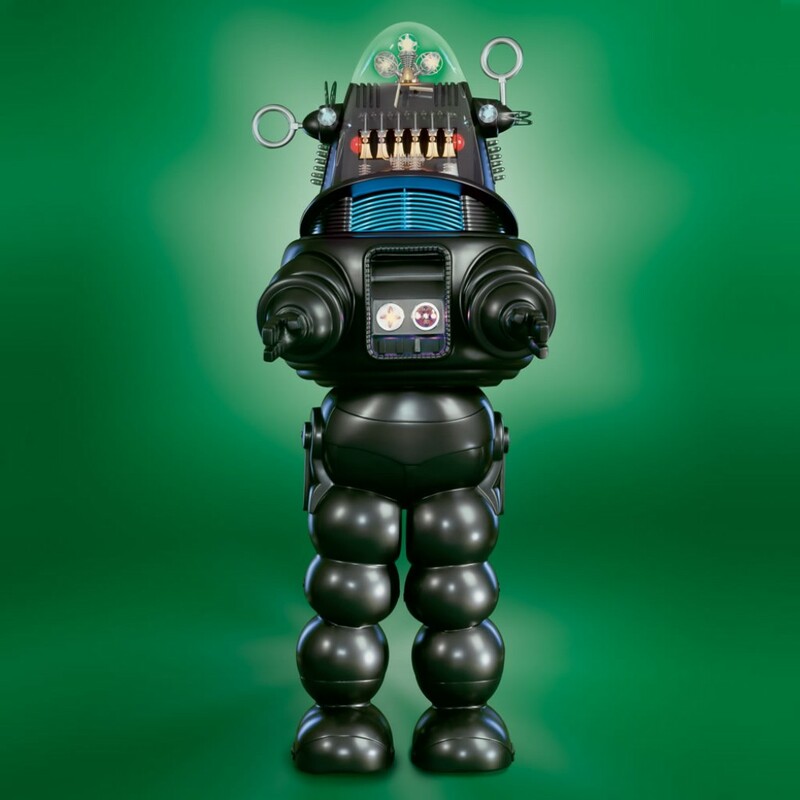 Czar & I often use his phrase, “Danger, Will Robinson!” as a warning about most anything. I recall a trick-or-treater in Oklahoma City when I was about 5 (1955) who was a robot (dressed in a costume made of boxes covered in foil) with various knobs & dials attached. The Roby in the photo is 7′ tall, and moves. STUNNING SIGHT as IMPRESSIVE USS Arlington passes the STATUE OF LIBERTY during Parade of Ships! Good day, nyet! 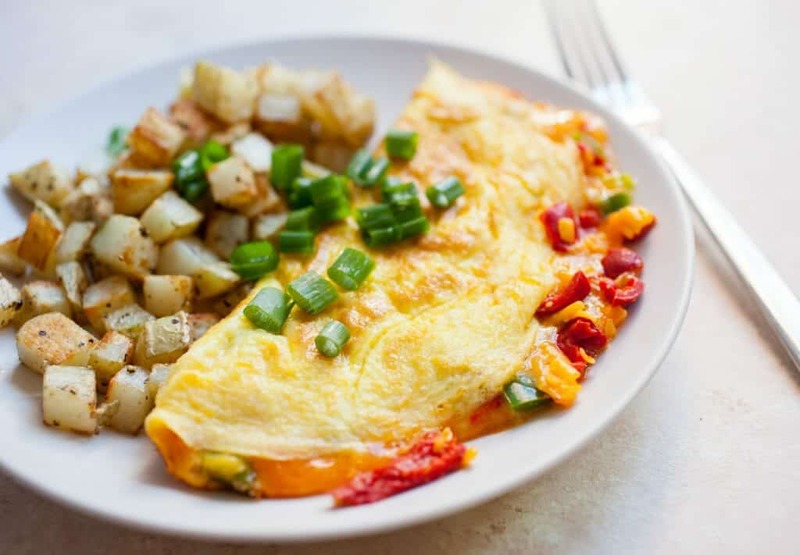 Well, just because I missed breakfast doesn’t mean I can’t have that delicious looking omelet for lunch, right? So, I’ll have that plus some Peach Schnapps which you so graciously keep on the bar shelves for me. Nye!!!!!!!! Evening everyone!!!!! Thank you, just coffee……..thank you…..
G’day, WeeWeed! Another day, another affront to decent people’s sensibilities. Not to mention health concerns. Any SJW who thinks it’s perfectly OK for people to live, defecate, shoot up and do who-knows-what-else on the streets is as sick as those same recipients of SJW largess. You mean the homeless drink Starbucks? Wow, they must be down and out. Oui, at what – 5 or 7 bucks a pop?? And they have one flavor – over roasted. 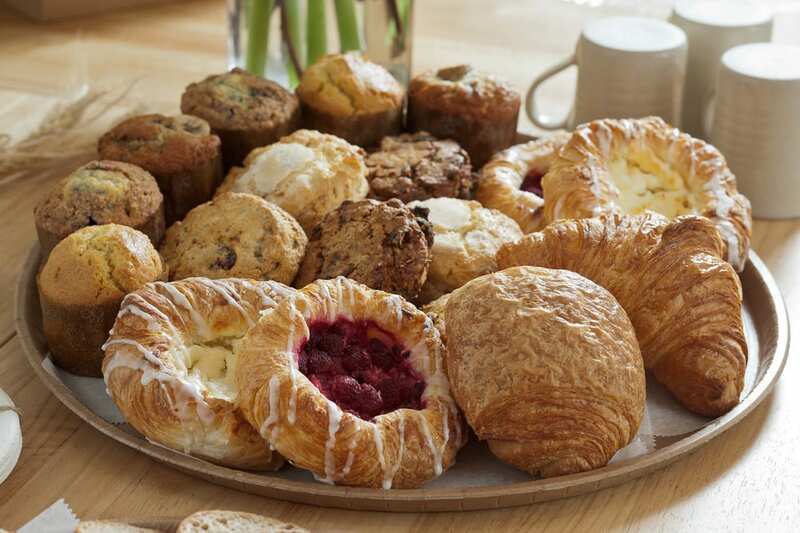 We have local coffee houses in NOLA that carry multiple kinds of coffees and blends, at a realistic price and minimal pretense. Hi everyone! A little late to the party, but wanted to get this done for our dear Sand&Sea & Joshua in the big “D” 🙂 Today’s state flower is….. THE TEXAS BLUEBONNET! In 1901, the Texas Legislature adopted the bluebonnet, of the annual legume Lupinus subcarnosus, as the state flower. The flower’s popular name derives from its resemblance to a sunbonnet. It has also been called buffalo clover, wolf flower, and, in Spanish, el conejo (“the rabbit”). in 1971, the legislation was amended to include L. texensis & “any other variety of bluebonnet not heretofore recorded.” At least four other species of bluebonnet grow in Texas. Contrary to various folk stories & legends claiming that the plant originated outside the state, L. texensis & L. subcarnosus are native to Texas. 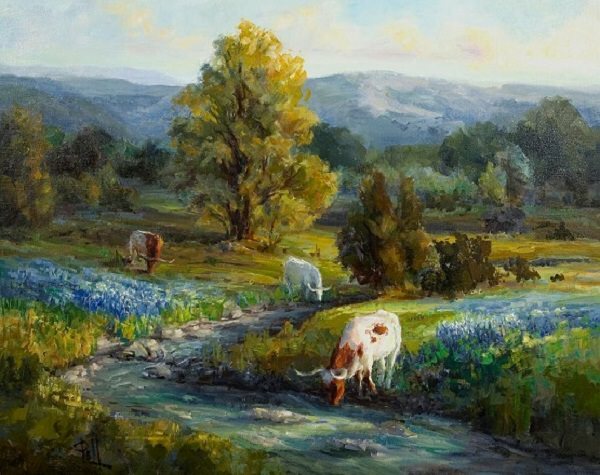 Although early explorers failed to mention the bluebonnet in their descriptions of Texas, Indian lore called the flower a gift from the Great Spirit. In the 1930s the Highway Department began a landscaping & beautification program & extended the flower’s range. Due largely to that effort, bluebonnets now grow along most major highways throughout the state. The flower usually blooms in late March & early April. In North Texas, they peak in mid to late April. Bluebonnets germinate in the fall, & fall rainfall is critical. Winter snow helps insulate the plants. The Lady Bird Johnson Wildflower Center explains: “Around mid-May, they form a seedpod, & the seeds mature. The seedpods pop open, releasing the small, hard seeds.” Many say the bluebonnets make pop-pop-pop-ing sounds. Texas A&M AgriLife Extension continues: “Only a small percentage of the seed germinates during the first season after planting. This delayed germination ensures species survival during periods of adverse growing conditions. A maroon version of the state flower that’s sprouted at the University of Texas Tower in Austin has some wondering if it’s the work of Aggie pranksters. Flower beds containing brightly colored bluebonnets are now home to a variant known as Alamo Fire, which is a shade of maroon. (The Texas A&M colors are maroon & white.) There’s speculation in the land of the Longhorns that Aggies are responsible for sprinkling Alamo Fire seeds on the UT campus. Texas A&M horticulturists developed the maroon variety in the 1980s in an attempt to plant a floral Texas flag in honor of the state’s sesquicentennial. The recessive maroon hue will recede over time to the bluebonnet’s dominant shade of indigo. In 1997, the Texas Legislature named Ennis the Texas Bluebonnet Trail & the official bluebonnet city of Texas. 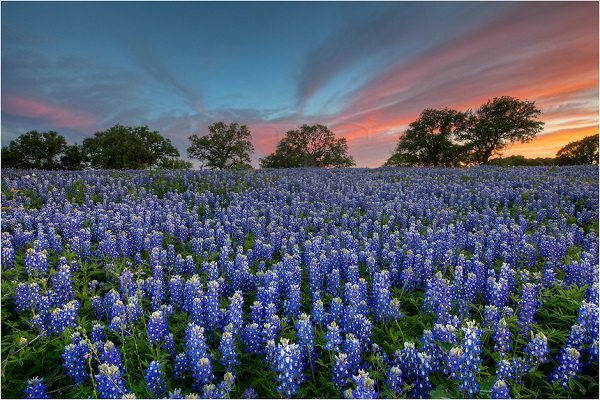 Every April, up to 100,000 people go to the Ennis Bluebonnet Trails Festival. It’s home to 40 miles of roadsides covered with wildflowers. Chappell Hill, which earned the title “Official State of Texas Bluebonnet Festival.” has it’s 50th annual Bluebonnet Festival. 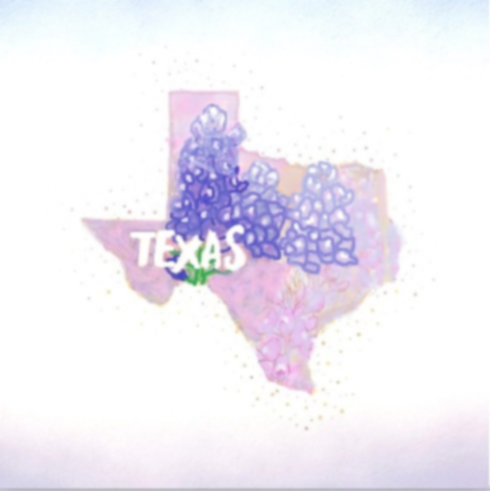 Perri Angela Wickham, a bluebonnet addict, posts regular bluebonnet updates on her website, bluebonnetlove dot com. You’re okay now. Sorry – I was watching the President’s speech! Bluebonnets…I think they are the same as what we Californians call Lupines. Love the painting, G&C! Beautifully rendered and wonderful colors. It is a specific species of lupine, endemic to Texas, yes. In Oklahoma yesterday a shooting happened, one killed, more injured and a civilian with a gun took him out before he could keep on shooting. Democrats in this state and even a few Republicans immediately started tweeting and making FB posts that we need common sense gun control. They’ve had no response to the Oklahomans who have told them all common sense gun laws would do is stop the good guy with a gun who took the shooter out. Common sense gun control: being able to shoot bad guys until the cops can get there. This shooter was a CLEET certified armed security guard. None of their bs gun grabbing would have prevented him from doing what he did. In order to become certified and allowed to carry he also had to pass a psychological evaluation. Maybe someday sanity will prevail in this country and the idiots will go stand in a corner and shut their mouths. Like psychological testing does much -I worked with two LEOs who are on death row for murder. They won’t admit it, but it proves background checks are bs, they will never stop someone who decides to murder. This person was trained, had all kinds of background checks and was deemed psychologically fit, but it didn’t stop him from taking a gun and shooting innocent people. So what’s their next argument, nobody have guns including security guards and LE? They tried, back in the 70s, to have LEO leave their forearms in the stationhouse after work. I expect this shooting to be pushed off the front pages because it doesn’t fit the narrative. For one good guys with a gun stopped him before he could commit a mass shooting and second the shooter was trained and certified. He wasn’t some nut with a gun, but had the government seal of approval. NRA used to have a section in their monthly magazine that detailed legally armed citizens stopping crimes. Back in the 90s we had a local newsman who was robbed right in his home’s driveway and said on air that he was going to get a CCW whilec another anchor got into a gunfight with a mugger. You remember the old wag about a Democrat/liberal being Republican/conservative that hasn’t been mugged yet? Watch this video and tell me this guy wasn’t a few bricks shy of a load. First thing I noted was Lake Hefner – I used to fish there when we lived in Midwest City in the very early 60s. Yup, and I’m sure that many nutjobs that should be on radar aren’t as the prog apologists make all sorts of excuses why these deranged creatures should be treated like visiting dignitaries. There’s also an industry that’s built up around street nutjobs, outpatient treatment,therapy, housing – too much $$$ involved to rock the boat. Thge other thing is their numbers – if I had a buck for every regular, never mind ‘surprise!’ nutjob we encountered on the street I could have retired much earlier with more money. You just can’t put ’em all on as roster and keep track of ’em realistically. You’d think something would have been picked up in psych evaluation. Again it’s ignorant to think background checks or training or psych evaluations will stop all the crazies and evil people. If they don’t have a gun they will use a different tool and the one truth that will always be the truth is that a good guy with a gun is the only thing that can stop a bad guy with a gun. Psych evals aren’t science, they’re social science. You can get pretty close sometimes but it’s not exact which is why every good psychologist keeps a Big Book of Excuses in his backpack. We had psycologiosts doing screening evals in Special Operations but still bad guys slip through. We have many large departments doing psych evals for LEO but look at what happens. I personally like the excuse that the system works but it’s bad psychs that cause the problems….but wait, weren’t they created and certified by the top tier psychologists, the creme de la creme, those at universities who are the gatekeepers of the trade? I’ve never held much stock in shrinks. Folks who aren’t pure leftist idiots just need to get it through their head, their are bad men in this world and always have been and they will use any tool to kill and maim people. You go back to the days of locking the crazies up and stop teaching people to fear guns along with teaching morality and the majority of the mass shootings will stop. Not all of course because evil will always exist on earth as we know it today. Nothing in the NO paper about it at all…..
Just call me ‘slow’…Over the past month, it seems as if every site that I visited demanded that I check a box to accept their new user terms. I couldn’t figure out why. Well, this morning I received a notice from Imgur and their email finally clued me in. It appears that any site that has recently asked for an acceptance of new terms is subjecting you to the regulations of the European Union that go into effect today. Dog adopts ducklings. So cute. I have told this story before, apologies if you’ve seen it, but I can never resist. Back when my kids were growing up we had an awesome Golden Retriever named Sam, and a mama cat with kittens just weaned when the cat died. Sam raised the kittens, keeping them all together against his stomach, laying there with them just like their mama. Eventually he played with them like pups, carrying them around by their fur, even tossing them and they would run back. Finally the day came that he thought they should learn his favorite thing, swimming. He tossed each of them in the pool and then would jump in after each one, nosing it along and then flipping it up and out. After a few days when he walked out onto the diving board five kittens would follow him and jump in. Those kittens acted like pups, and played like them too. We’ve always had some weird critters. 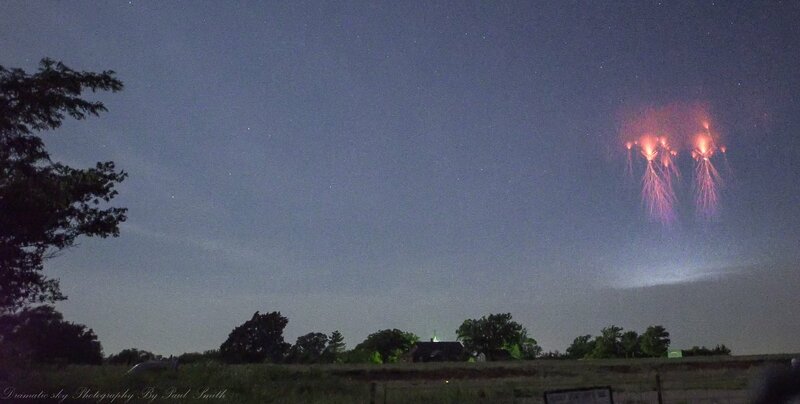 Still amazed… my best sprite lightning capture to date. A beautiful jellyfish, close range from Highway 33 in Kingfisher county, Oklahoma this morning 5/24/2018. 12.55am local time looking NW towards Alva Ok. You can even see the colour change in the tendrils going into the lower atmosphere. Please like and share. Contact me for usage :smith.paul.michael1@gmail.com. I think it was Nat Geo that had some amazing pix of sprites taken from orbit. Get me her address, maybe we can trade possums. We don’t grow cantelope anymore as the possum loves ’em, they eat the ^&$#@* out of our persimmons, if I don’t burn the trash after I put it on the pile the soons and possums draw straws to see who’ll go at it first. Don’r zactly turn their rat noses up at the tomaters either. Opossums are super valuable creatures. In the past people believed they carried diseases. My neighborhood in West Los Angeles had lots of them and after research, I discovered ‘possums have low body temperatures and don’t carry transmittable diseases. Subtropical storm (AKA ‘big rain’) Alberto is up to a level of importance in the local news to where they now play three or four threatening-sounding bass notes before they begin a report on it. Thios is still while only projecting 3-5″ of rain over three days, I can only imagine what they’ll do if the projected path swings more west. As for that ‘projected path’ thing, I do wish the stations could agree with where that is. Last year, while we were rummaging around the season’s end plant sale at Wally World, we ran across the beaten down Charlie Brown-looking rose bush for $2. What the heck, we thought, for 2 bucks we can’t go wrong, why not try. This year it started to bloom I’m going to find out how to get the pix frpom my phone to the site, it’s the most amazing rose. The flowers start out white and peach and move thru color phases until they get to a deep dark red velvet. Don’t think we’ll plant this one, we’ll leave it in a big pot on the patio. Not a bad deal for $2. And the stick partt of the bush still looks Charlie Brownish but it’s putting out these amazing blooms. Crap Ireland. Just plain, heartbreaking crap. You can bet it’ll only be the Irish who kill their babies in the womb. The “refugees” certainly aren’t going to do it. Guess who ends up winning in the end.